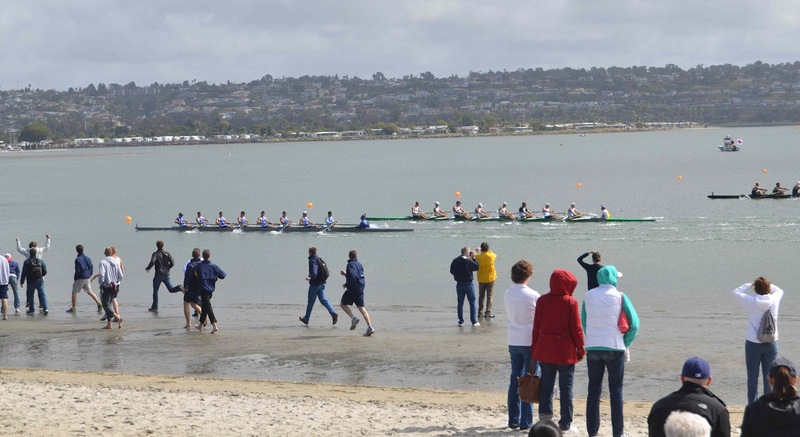 The 2012 San Diego Crew Classic showcased some of the nation's top talent, and the athletes did not disappoint on Mission Bay last weekend. The racing was fierce, and when all was said and done, we felt pretty good about our picks, with a few notable exceptions. Let's take a look. As we anticipated, the Crimson were able to handle a very strong challenge from the Cal Bears, who led through the early stages of the race. Navy proved to be stronger than Stanford, who made use of an extremely unconventional rig (which made the Cardinal men's varsity eight one of the talking points of the regatta). Cornell and Michigan rounded out the final, in keeping with our predictions. Again in keeping with our predictions, Grand Valley State University took first place in a tight field (an entry that featured novice standout Nate Biolchini in the four seat–Biolchini recorded a 6:06.3 at CRASH-Bs in February). However, Drexel did not show the speed we anticipated, and the Fightin' Irish of Notre Dame had a great showing, and were perhaps only an equipment malfunction away from a Cal Cup victory. Six seat (and top Irish erg score) Zach Stackhouse had to stop for several strokes as the CLAM on his oar failed–he reached out, grabbed it, and threw it off while racing the first 500m–putting the Irish in fifth place for much of the first 1000m. They drew level with GVSU with 300m to go, but were unable to hold off the Lakers' late charge and took second place. Purdue came through with a solid third place, and will likely be a strong competitor through the second half of the season, having moved up an ACRA champion frosh class to the varsity squad this year. While we expected Harvard to take this event, Cal were able to turn the tables following a loss in the varsity eight, winning by roughly a length over the Crimson. Also, showing more depth than last season, the Bears 'B' entry finished third and spoiled our pick of Cornell. Big Red didn't bring as much top end speed to this race as we expected, but will likely have their sights set on goals further down the line (head coach Todd Kennett knows how to deliver at the end of the season). Marin absolutely dominated once again, winning by a comfortable margin over out pick for second place, Everett. Despite having shown early season speed, Los Gatos, our pick for third, failed to make the final, and St. Ignatius stepped up to the challenge, crossing the line ahead of perennial SoCal contenders Newport AC, Marina AC, and LBJC, respectively. As we expected, the Women of Troy once again showed great early season speed, winning the varsity eight over Virginia by roughly eight seats to take the title for the second straight year. Our pick for third, Cal, was unable to hold off a resurgent crew from Washington, falling to fourth place, with UCLA edging Stanford into sixth place. The Duke Blue Devils (our No. 2 seed) returned to Mission Bay for the first time since 2002, and did so in style, winning their event over Oregon St. and our No. 1 seed Oklahoma, respectively. The Iowa Hawkeyes did reach the final, but wound up in sixth place behind local favorite USD and a growing program at Tulsa. 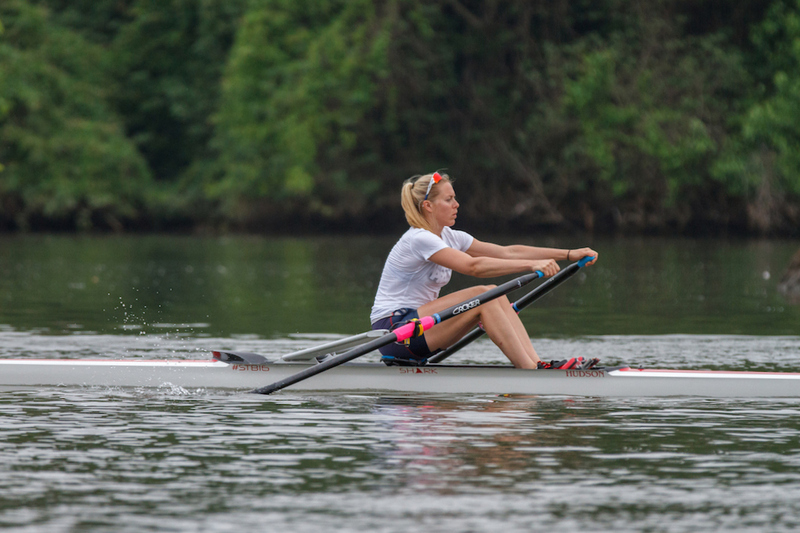 The UCLA women's team may have been the story of the regatta–and we're not the only ones who think so (the Bruin women have gone from unranked in the previous CRCA/USRowing coaches' poll to tied for third overall with Washington). The Bruins entered the regatta having lost the six seat of their varsity eight to an injury sustained while cooking, so each of the crews was untested entering the fray in San Diego. The UCLA JV responded to adversity by taking the event by open water over our pick for No. 1 Washington, and Virgnia, respectively, with the Bruins having already gotten the better of Stanford in the varsity eight. Our picks for second and third, Cal and USC, fell to fifth and sixth to round out the final. Our No. 1 seed, Virginia, got the job done for Kevin Sauer, winning the event over a strong entry from Washington State and another fast combination from UCLA, which might have been in contention had it not been for a crab in the first 500m. Again, our picks for second and third, USC (last year's champ) and Washington, fell to fifth and sixth place, respectively, behind Tennessee in fourth place overall. 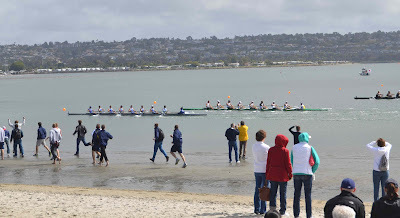 As expected the Oakland Strokes kept it rolling, taking first place by roughly seven seconds over a very young Connecticut Boat Club, who reversed our prediction with Marin, edging MRA into third place. 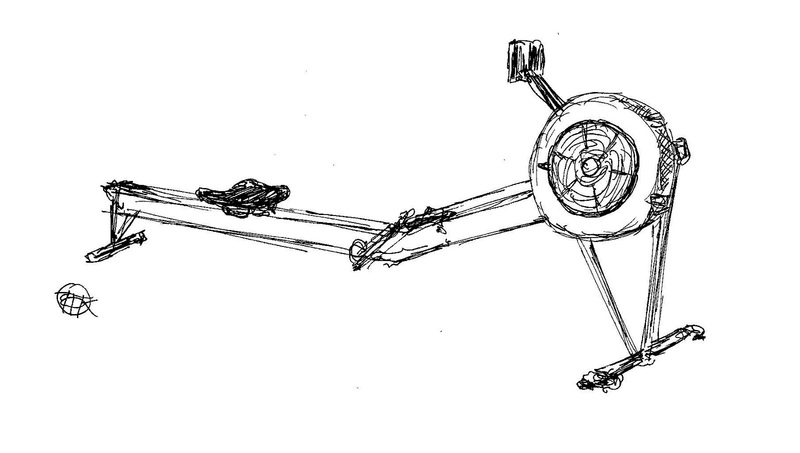 Also as predicted, Upper Natoma made the final, taking fifth place overall. Congrats to all those who raced over the weekend, and for complete results, please visit the official site of the San Diego Crew Classic. Thanks to all those whose hard work made the event such a success once again!